Into the Woods! Camp at Coterie culminates in a performance. Photo courtesy Coterie Theatre staff. Always a fun place to take the little ones and wear them out before a nap, Deanna Rose Children’s Farmstead never disappoints. With lots of animals to see and pet, and picnic tables for after your family excursion, Deanna Rose is an ideal morning or afternoon summer jaunt and a perfect place to meet up with friends. Visit opkansas.org for a schedule of special activities. 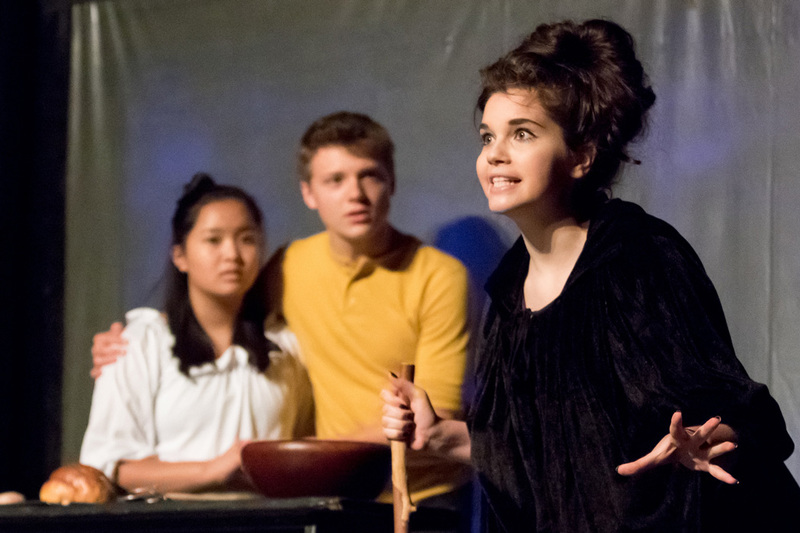 Camp Shakespeare is a fun and unique summer arts experience your kids will never forget! Taught by professional theatre actors with years of experience performing & teaching Shakespeare in a neighborhood near you. Where KC Plays! KC Parks presents numerous cultural activities and events year-round in our parks and facilities and offers classes for youth in dance, music, art and pottery. Registration is open for Summer Enrichment Day Camps, which run from June 4 through Aug. 10 at six KC Parks community centers. Campers will work on art projects, play their favorite games and sports, take swim trips and visit local attractions. More at kcparks.org. Kansas City Young Audiences Week-long Summer Camps offer kids ages 4 and up week-long, fun-filled performing and visual arts camps. New camps begin every Monday, June 4 through Aug. 3. Camps culminate in a sharing for family and friends at the end of each week. Scholarships and payment plans are available. Learn more at kcya.org. Serving children ages 3 through 18, from creative movement to ballet, with campuses downtown and in Johnson County, Kansas City Ballet offers something for every skill level and age. At the gorgeous Bolender Center, there are more intensive five-week class offerings for the serious ballet student. Open Tuesday through Sunday, check lakesidenaturecenter.org often for special events. Located in the sprawling Swope Park, Lakeside is a hospital for injured wild animals from the region, where you can safely get up-close to everything from bald eagles to rattlesnakes. Offering programs like the Homeschool Science Lab, Magic Woods, Breakfast with Beasts, BUGS!, What’s Out at Night and more, the Lakeside Nature Center is awesome fun for anyone wanting to learn about the natural environment around us here in the metro. Take a hike on the trails nearby afterwards for the full experience. The City of Leawood presents free quality entertainment to families at Ironwoods Park. This is a great opportunity for introducing young audiences to the arts. The Leawood Arts Council presents “Grinnin’ & Groovin’ events for kids on Tuesday mornings in June and “Sundays in the Park” concerts on Sunday evenings in August for the entire family. Visit www.leawood.org. Leawood Stage Company will present “West Side Story” July 13 through 21 at 8 p.m. nightly. This blockbuster will feature outstanding performance by teens and adults. Visit www.leawoodstageco.org. The Historic Oxford Schoolhouse built in 1877 is open daily throughout the summer at no charge and participates in the KC Passport to Adventure. “Old time Stories and Fun” meets Wednesday mornings in June and July at a minimal cost. Each session includes a reading plus and an activity. Visit www.leawood.org. Check the calendar at powellgardens.org regularly so you don’t miss a thing! Powell Gardens regularly hosts hands-on activities for the wee ones, and you can plan your own enrichment activity while you’re there. You couldn’t ask for a more beautiful place to inspire your budding artist and inform your next garden project. Internationally awarded for “Visitor Experience” by ASTC and named one of the country’s TOP 25 science centers, Science City annually educates and entertains hundreds of thousands of science-thirsty children of all ages. Kansas City’s Science Center is THE place for inquisitive young minds to create, explore, and experiment with the BIG world of science through hands-on learning and non-stop fun. 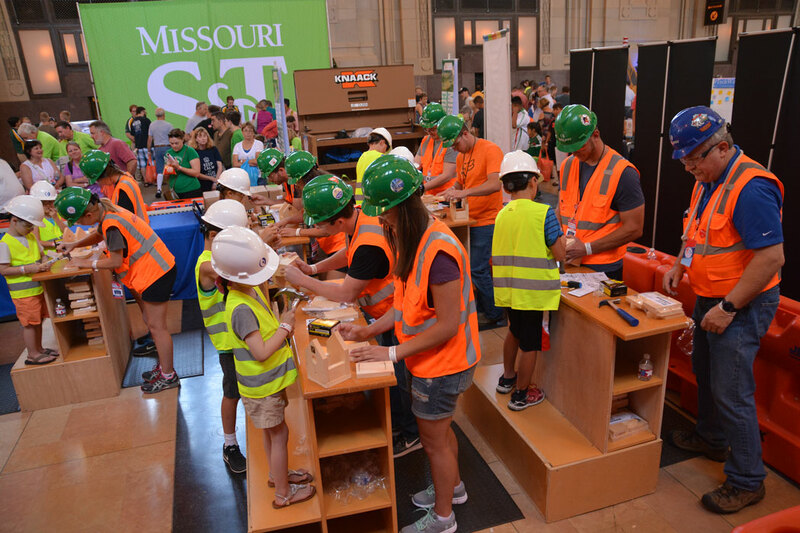 Centrally located in the heart of Kansas City and part of the historic and acclaimed Union Station complex, Science City boasts more than 325 interactive and static exhibits covering more than 92,000 sq. ft. of inside and outdoor space. Not too far north of the river, you can find history preserved. Call ahead 816-792-2655 and schedule your School Day, where up to 30 kids can find out what it was like to learn in a school circa 1881. While the kids are in school, you can enjoy one of the following tours: Journey Through the 1800s, a Private Tour or a Victorian Tea. All activities are affordable, the grounds are gorgeous, and there’s nothing like learning history (and appreciating what we have) by taking a step back in time. StoneLion Puppet Theatre presents Illuminated Waters, a FREE two-day festival, Memorial Day weekend at Theis Park, across the lawn from the Nelson- Atkins. Join us for live music, food, a Giant Puppet Show and family-friendly Glo Party. Interact with giant roving puppets, jugglers, hoopers, games and all kinds of great entertainment for the whole family. May 25 and 26 from 6 p.m. to 10 p.m.; Theis Park, Oak & W 47th Street, KCMO; visit www.stonelionpuppets.org for more information. The best way to learn history is hands-on. Arguably, the best way to learn anything is through play. The National Museum of Toys and Miniatures knows this better than any other experience-driven space in Kansas City. The joy crosses generations, and the museum is a perfect place to take the kids and the grandparents. Better yet, send the grandparents with your kids. If you’ve never been, June 9 is a great day for a glimpse into the museum with free visit day to see the kid’s marble tournament from 9 a.m. to 4 p.m. Step into the world of one of America’s historically important artists. Nestled on a wooded lot in Kansas City’s historic and beautiful Valentine neighborhood, right around the corner from Roanoke Park, is the home and studio of Thomas Hart Benton. See how a master left his studio as if he were just there and ready to tackle a fresh canvas. A wonderful example of how corporate profits can benefit culture, Crystal Bridges is a trip into the space where the two do meet. Bentonville itself is a wonderful, family-friendly town with so much to see, and after you do, enjoy Family Sunday at Crystal Bridges. A spirited, family-oriented adventure complete with hands-on activities and performance, this is a do-not-miss end to a weekend of family fun. May 19, from 1 to 4 p.m., visit The Art Cart for hands-on art projects inspired by works on display. In concert with the Big Botany exhibit, staff from the KU Natural History Museum will join the Museum staff to facilitate the contrast and connections between the natural and the man-made worlds. And then again on May 24, take your tykes back to The Art Cart for an intense study of pollinators. It can be a constant struggle to lure children away from their precious devices. Get them outside! There are so many incredible hiking paths in and around the metro. Here are some of my family’s favorite places to explore. Take a picnic to Jacob Loose Park and feed the ducks, but feed them frozen corn and peas, oats and seeds instead of bread (they’re gluten-free). Overland Park Arboretum and Botanical Gardens is a gorgeous place with kid-friendly activities, and if you have tots, bring your stroller and get a nice hike in. Parkville Nature Sanctuary is a gem in the heart of charming Parkville, complete with wildlife and waterfalls. Roanoke Park has a new, upgraded playground that’s a blast, but don’t forget to get lost in the woods all around you. Perry State Park outside of Lawrence has multiple trails along the water’s edge. Finally, another favorite is Weston Bend State Park. With incredible views and challenging trails, do not forget to pack water. Visit a gorgeous working farm that fills the senses, and let the children run. Washington Creek Lavender Farm is near Lawrence. June 9 and 10 they will host their annual spring festival and open house. Visit washingtoncreeklavender.com for directions. Take a step back in time at this incredible historic site. This is the only 19th-century woolen mill in the U.S. with its original machinery still intact. There’s so much to see, with fascinating machinery for your budding engineer. If you are raising a future entrepreneur this trip to Lawson is well worth it to see how the Watkins family grew their businesses. Camping, bicycling and fishing are all available nearby at Watkins Mill State Park. Christel Highland resides and works in the Crossroads Arts District founded by her artistic mentor and friend, the great Jim Leedy. In addition to furthering her studio practice where she focuses on developing her natural material usage, she curates MLB Gallery, hosts a quarterly event, The Salon for the Arts, and enjoys advocating for the Arts through KC Studio Magazine.